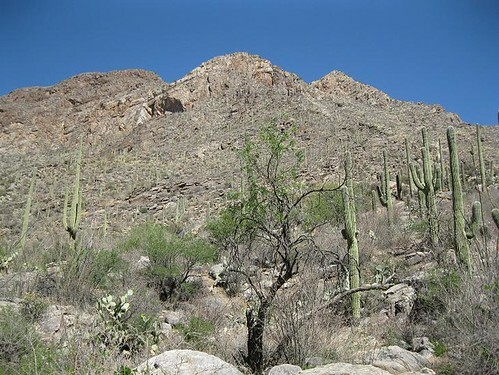 To reach the trailhead for the Pusch Peak trail, you'll want to go from the downtown area in Tucson and take Oracle Road until you reach Oro Valley. Once you reach Oro Valley, you'll need to turn east on Linda Vista Boulevard. You'll find the trailhead after traveling about a quarter of a mile on the right-hand side. Although this trail only takes about three hours to complete, it is not for someone who has not done a good deal of hiking as the elevation ascends quite quickly once you are on the trail. The overall mileage for this hike, which offers incredible views, is four miles round trip. Therefore, when you are hiking, make sure you are well-equipped. In other words, wear good hiking boots as well as gloves made for climbing to assist you in clambering up the boulders on this short, yet challenging journey. You will be able to ascend three different peaks before you come to Pusch Peak itself. So, if you are used to hiking, it's worth making the effort as the view at the top is simply awesome. After you find the trailhead, you'll want to start down the trail, making sure that you keep to the left. After going several hundred yards you will come to a fork where you will veer to the right. This will lead you down the primary trail. Proceed down the trail until you come to a marker. Once there, look to the right. At that point, you'll want to take the trail that will direct you toward the mountain that leads to Pusch Peak. Make sure you wear pants and a long-sleeved shirt. The trail is comprised of spiny and sticky plants so it's not really one where you can sit down and relax. Once you maneuver past the three peaks, you'll be rewarded with a view of downtown Tucson and the surrounding area, which, again, is simply magnificent!